This title page for a 1497 Venetian edition of Terence, reproduced here in Early Venetian Printing Illustrated (Venice: Ferd. Ongania, London: John C. Nimmo, and New York: Charles Scribner’s Sons, 1895), was copied and repurposed by both Daniel Berkeley Updike of The Merrymount Press and Bruce Rogers. The Merrymount Press version of the title page deleted the central portion with the chandelier, apse, pedestal, and figures. In its place a blank hanging banner was inserted. The revision of the Terence title page was probably made by Thomas Maitland Cleland, though the lack of his identifying C means that it could also have been executed by W.A. Dwiggins. 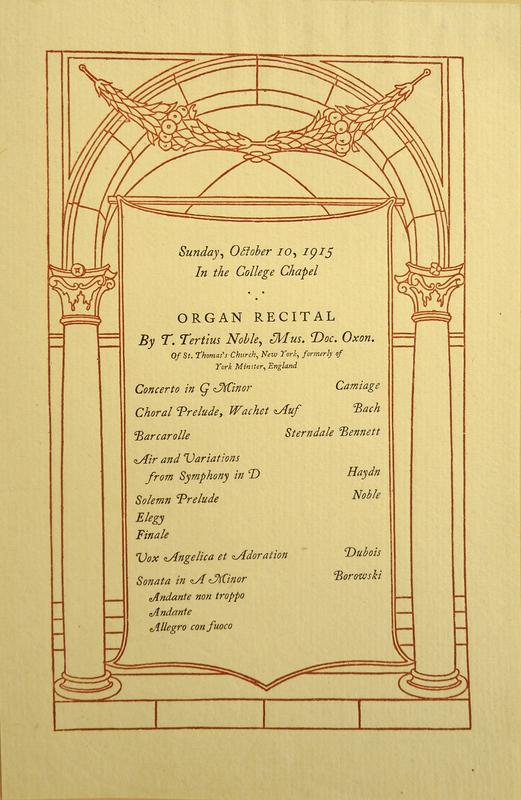 Program for Organ Recital (October 10, 1915). Printing by The Merrymount Press. 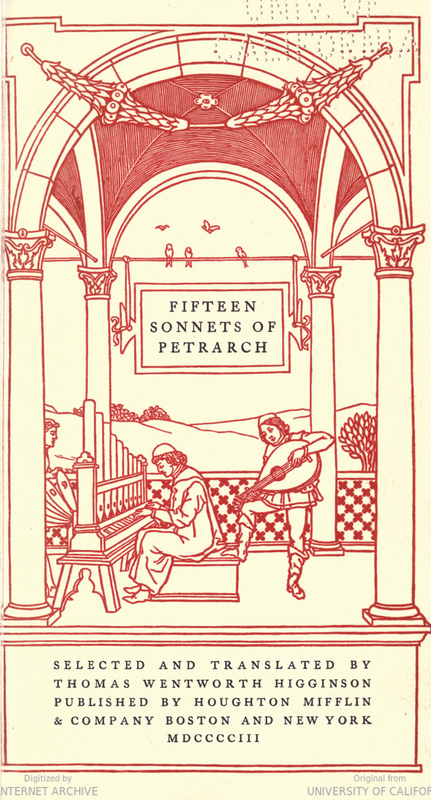 Bruce Rogers, during his tenure as designer of The Riverside Press books for Houghton, Mifflin & Co., used the 1497 Terence image as the basis for the title page of Fifteen Sonnets of Petrarch selected and translated by Thomas Wentworth Higginson (Boston and New York: Houghton, Mifflin and Company, 1903). He substantially altered the design, turning an indoor space into an outdoor one. To do so, he followed Updike’s lead and removed the chandelier, pedestal, apse, and all of the figures. Then he inserted a trio of musicians, designed a decorative wall behind them, hung a tabula ansata containing the book’s title from a cross rod, and added a few roosting birds to animate the whole scene. Title page of Fifteen Sonnets of Petrarch selected and translated by Thomas Wentworth Higginson (Boston and New York: Houghton, Mifflin & Company, 1903). Design by Bruce Rogers. What makes Rogers’ design so astonishing is that the musicians and landscape were copied from another woodcut reproduced in Ongania’s book. It can be found at the bottom of p. 140 nearly obscured by a thicket of decorative initials. 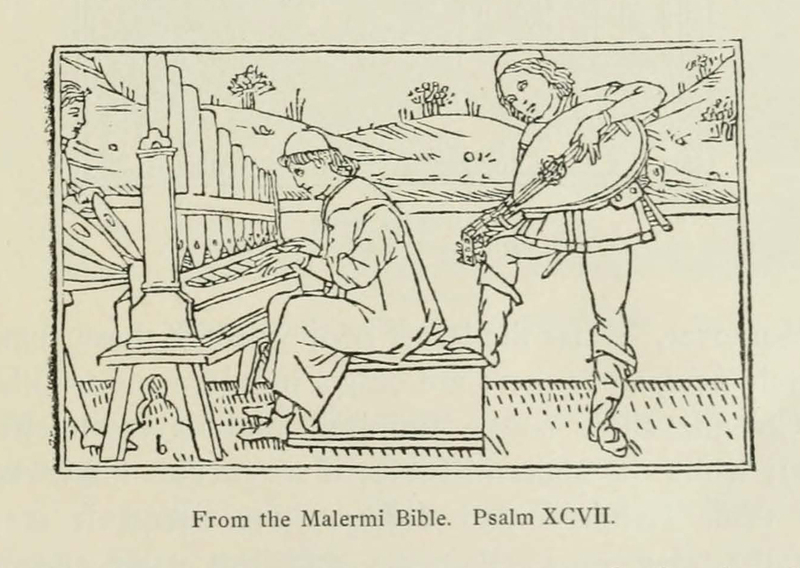 A larger and better printed version of the image—which comes from Psalm XCVII in the 1490 Malermi Bible—was also reproduced on p. 85 of The Art of Wood-Engraving in Italy in the Fifteenth Century by Friedrich Lippmann (London: Bernard Quaritch, 1888). (Rogers may have seen a copy of Lippmann’s book at either The Boston Athenaeum or the Museum of Fine Arts, Boston.) He did not copy the woodcut exactly, but instead improved the faces of the musicians, tidied up the clothing of the luthier, sharpened up the organ, and deleted the extraneous foreground and landscape detail. Page 140 from Early Venetian Printing Illustrated (Venice: Ferd. Ongania, London: John C. Nimmo, and New York: Charles Scribner’s Sons, 1895). 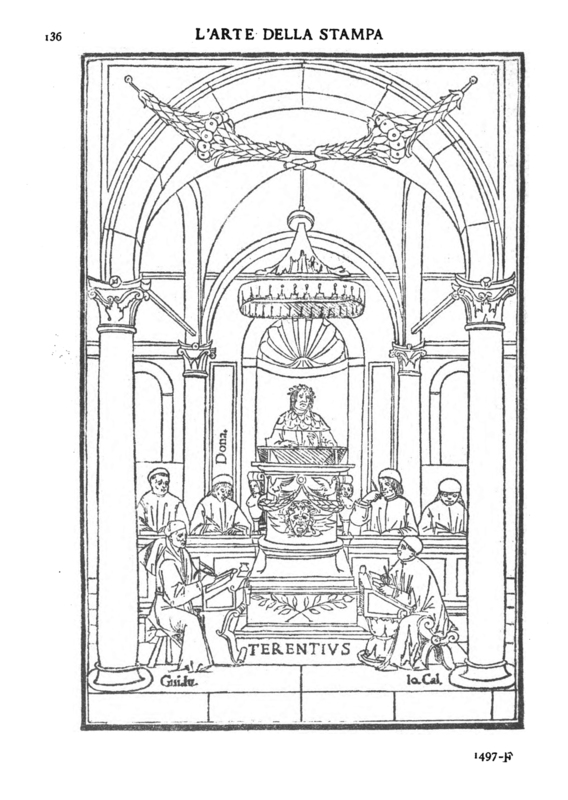 Rogers’ seamless integration of these two disparate Venetian woodcuts into a single charming image transcends his more celebrated instances of adaptation of historical material such as the borders for the Songs & Sonnets of Pierre de Ronsard (1903) and Fra Luca Pacioli of Borgo di S. Sepolcro by Stanley Morison (1933). It is a design worthy of the high regard in which many hold Rogers. Woodcut from the Malermi Bible reproduced in The Art of Wood-Engraving in Italy in the Fifteenth Century by Friedrich Lippmann (London: Bernard Quaritch, 1888), p. 85. 1. Onganis took the title page from a Terence printed in 1497 by Lazarus de Suardis for Simone de Luere. 2. A proof of the design without any type added is item no. 1051 in the Merrymount Press Book of Designs I in Special Collections, Providence Public Library. The idea for the hanging banner may have been inspired by a design on p. 146 of Early Venetian Printing Illustrated. 3. See the entry for 8 o’clock on Sunday, October 10 in the Programme of the Celebration in The Fiftieth Anniversary of The Opening of Vassar College October 10 to 13, 1915: A Record (Poughkeepsie, New York: Vassar College, 1916), p. 303. 4. The Italian Bible of Nicola de Malermi was printed by Giovanni Ragazzo in 1490 for the Giunta. The musicians can be found on p. 404. 5. 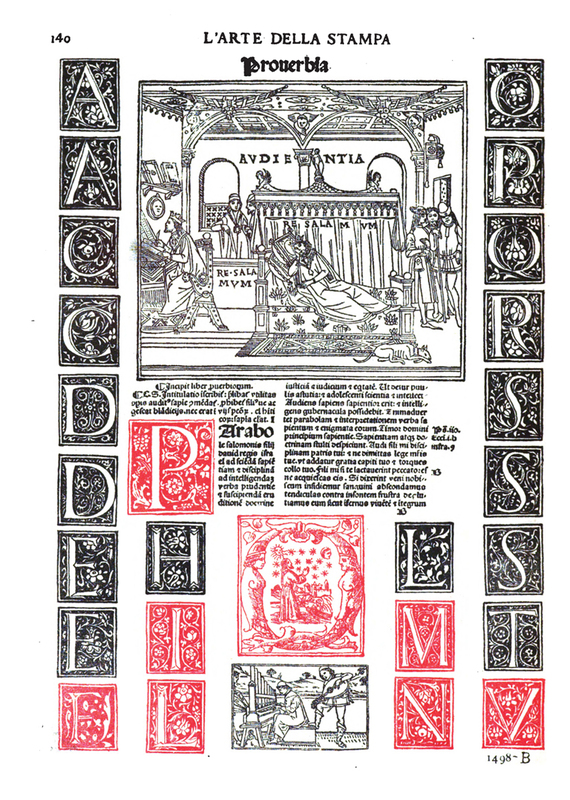 Of Rogers’ skill in adapting, redrawing, and appropriating historical material, Jerry Kelly writes, “The Ronsard is a particularly revealing example of BR’s genius in this regard: the title-page border, first used by Jean de Tournes in France in the sixteenth century, was well known to students of printing history. But instead of ‘lifting’ the border as is, Rogers extended it by adding a section, making a taller and narrower enclosure for the title-page text.” The First Flowering: Bruce Rogers at the Riverside Press 1896–1912 by Jerry Kelly (Boston: Thomas G. Boss Fine Books, 2008), p. 25.